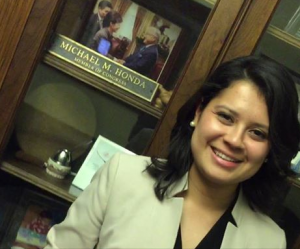 WASHINGTON — Rep. Mike Honda (D-Santa Clara) was joined by Claudia Flores, an immigration rights activist and congressional fellow who was allowed to stay in the U.S. thanks to the Deferred Action for Childhood Arrivals program (DACA), at Tuesday’s State of the Union Address. Flores and her family moved to San Jose from Honduras when she was a teenager. She became a leader at San Jose High School and in her community, eventually earning a full-ride scholarship to Santa Clara University. Two summers ago, she arrived in Washington, D.C. and worked as an intern in Honda’s office. Fueled by her passion for social justice, she later joined the national immigrants’ rights movement, advocating for millions of families, including her own. “I am in Washington, D.C. because I feel that I have a responsibility to serve as a voice for the millions of immigrants in my community who are simply asking for an opportunity to live their dreams,” she said. Flores holds a bachelor’s degree in political science, and is currently a public policy fellow with the prestigious Congressional Hispanic Caucus Institute.